Stylish, amusing, and yet so practical, this organizer is the perfect way to maintain all your cosmetics, earrings or hair add-ons neat, prepared and at arms reach. The beautiful clear acrylic classy design permits the whole lot to be easily visible in addition to handy. Arrange your lipsticks, blush, eye shadows, concealers, nail polish, foundations and creams multi function place. Rather, save your hairbrushes, combs, clips, curlers, hairdryer and other hair components all collectively. 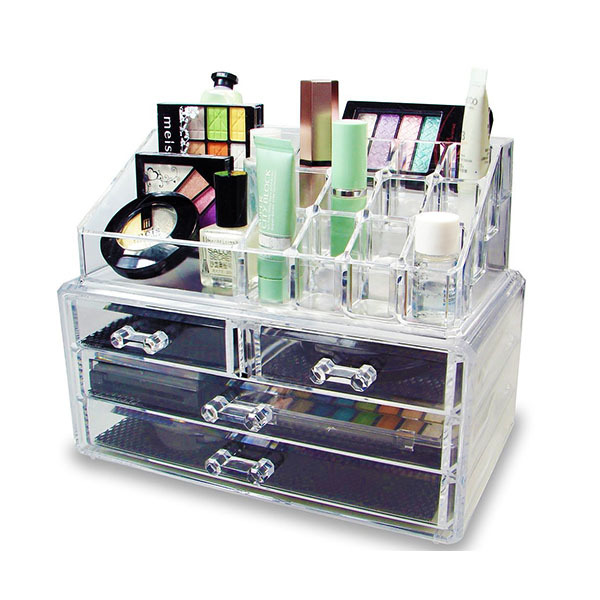 Earrings, scarves and different add-ons can also be neatly saved with this organizer. This is one object this is certain to simplify your day by day self-care recurring. The organizer can elegantly sit on your arrogance, bathroom counter, bedroom cloth wardrobe or maybe your office table. Prevent rummaging around through numerous drawers and beauty luggage to locate the whole thing you want. Clearly have all your necessary items already accumulated collectively and neatly organized proper in front of you. This organizer makes a really perfect gift at any age and stage in life; it honestly can be preferred through every one.